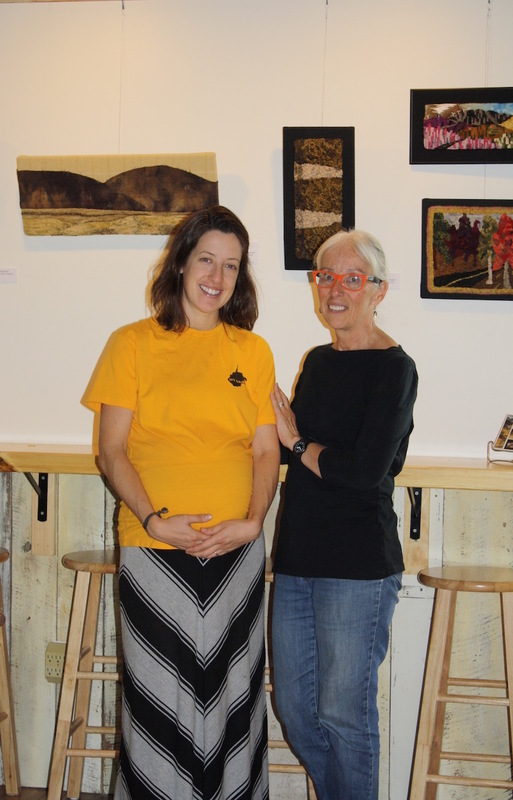 There is an arts community evolving at The River House in Capon Bridge, Hampshire County, WV. Monthly art exhibits feature one artist or a theme, September it is me! Meet and greet Friday Sept 1 4:30-5:30 followed by an open mic night. 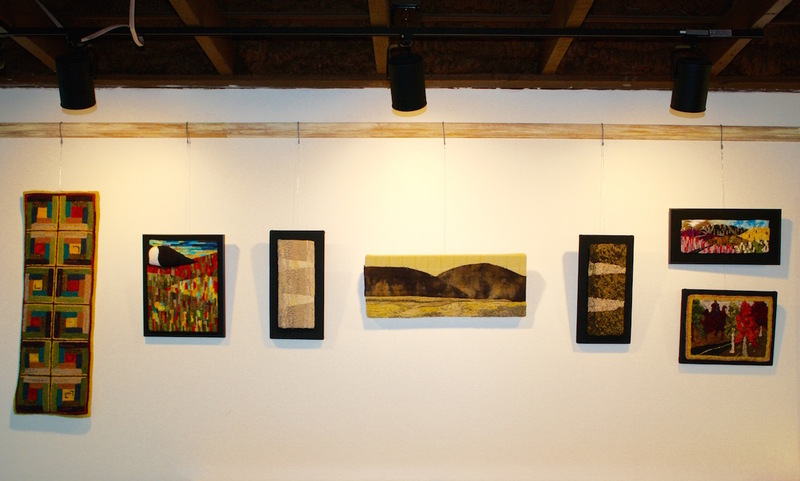 Fiber art is on display Thursday-Sundays through Sept 24 which is Capon Bridge’s Founder’s Day celebration also. Food, classes in art, music, craft, food, general living skills are conducted by members of the community. Come visit, we are one county into WV just west of Winchester, VA and 2 1/2 hours from Washington, DC on RT50W. Track lights and a hanging system on white walls creates a gallery display for cafe goers and entertainment audiences as they listen/participate in staged shows. The natural wonder of West Virginia is affected by humans exploring, encroaching and expecting the resources to make them happy. Voices both vocally and visually are used to bring awareness to the fragile environment. The latter method to communicate is my preference, believing the image of even a tourist’s visit captured using traditional crafts will encourage awareness and protection for the future.I encourage you to view my art for the moment of beauty I captured and shared with you. The opposite wall presents the Iconic Series created over fifteen years. The pieces chronicle three generations of women. My grandmother came of age in the 1920’s working and supporting herself prior to marriage. That marital relationship from the stories I heard and witnessed was one of equal responsibilities as entrepreneurs. Iconic Liberty and women’s right to vote in 1920 symbolizes her powerful self-esteem. The circle in each design is an ancient symbol for life. I used it because our lives are part of a continuum. We all have contributed. There are four small pillows with hooked fronts and embroidered backs bringing attention to contemporary issues: Gender, Climate, Rights, and Persisting. Generations of artists used traditional crafts to communicate: reflecting, documenting events, opinions and the spoken word. Perhaps it is my comfort with age, a realization that my voice is heard, or a confidence that others can be encouraged to think; whatever drives me the making of this body of work is cathartic. It will be interesting to talk with visitors Friday and through the month sharing techniques, approaches to subject and issues raised by these visual objects. Except for the Iconic Series the works are for sale. There are also several images made into notecards. Can’t visit in person shop online at my store. This entry was posted in elements and design in art, Fiber Musings, hooked rugs, note cards, textile art, West Virginia Artists, Year Study and tagged fiber artists, fine craft, hooked rugs exhibit, Susan L. Feller, The River House WV, west virginia on August 30, 2017 by Susan L. Feller. I gather nature – preserving the pieces for a while longer. I use nature as the skeleton for my work. I am nature and my actions reflect its energy. I noticed when the green leaves are behind the mahogany ones we can see them better. These leaves were not pressed and I decided to give my piece dimension stuffing two leaves and using yarns to define the veins. After working the design I painted the linen. Best lesson here is paint surface FIRST then develop the motifs. The year study lead me to reconsider how to approach each work. In rughooking the details are completed first, working out to background. But as noted in this square the surface needed to be painted before building up the leaves. I just have to remember to consider how before doing. This entry was posted in elements and design in art, Fiber Musings, hooked rugs, textile art, West Virginia Artists, Year Study and tagged farm life, fiber artists, hooked rugs, Susan L. Feller, west virginia on October 15, 2016 by Susan L. Feller. One day in high school English class Mrs. Bowen assigned us an EE Cummings poem. Minutes went by as I stared at the letters and then….. I read it! Decades later I honored this experience with “A Leaf Falls”. Welcome to my favorite season. The design evolved from a sketch of migrating birds gathering seeds outside of our home one October day. The Carolina Wren’s tiny body with tail sticking up and beak down looked like a leaf. Gathering yellows and muted gold wools, I organically filled in defined shapes keeping three openings for my leaves. Two leaf shapes are stuffed and stitched onto the linen backing. Their veins and stems are copper wire anchored by gold threads. The third is partially stuffed but its edge flutters because of a layer of iron-on interfacing with wire inserted between two pieces of wool and bent to shape. I sent off a card with the image and poem as a thank you note to Mrs. Bowen and received a lovely note back. It felt nice to have been able to send my appreciation after all these years. This entry was posted in elements and design in art, Fiber Musings, hooked rugs, textile art, West Virginia Artists, Year Study and tagged fiber artists, hooked rugs, Susan L. Feller, west virginia on September 24, 2016 by Susan L. Feller. Two days ahead of Puget Sound Rug School I have immersed myself in Seattle visually and physically. Who knew you could “hike” five miles in a city? Camera in pocket and rain gear on here are some inspiring compositions. First stop was a fiber mecca for me. 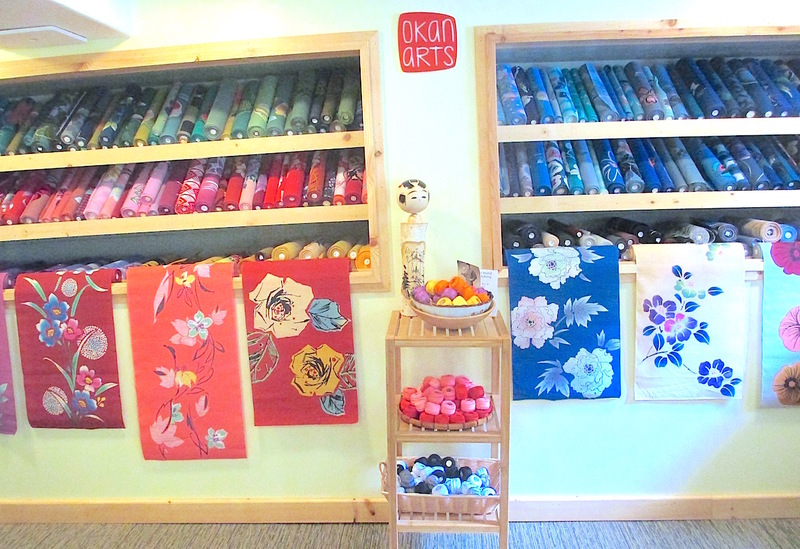 Patricia Belyea has amassed an amazing collection of Japanese yukata cottons available for US quilting and fiber artists from her shop in Seattle or online at OkanArts.com. I selected bold patterns and intimate repeats of lines to be combined into my art. 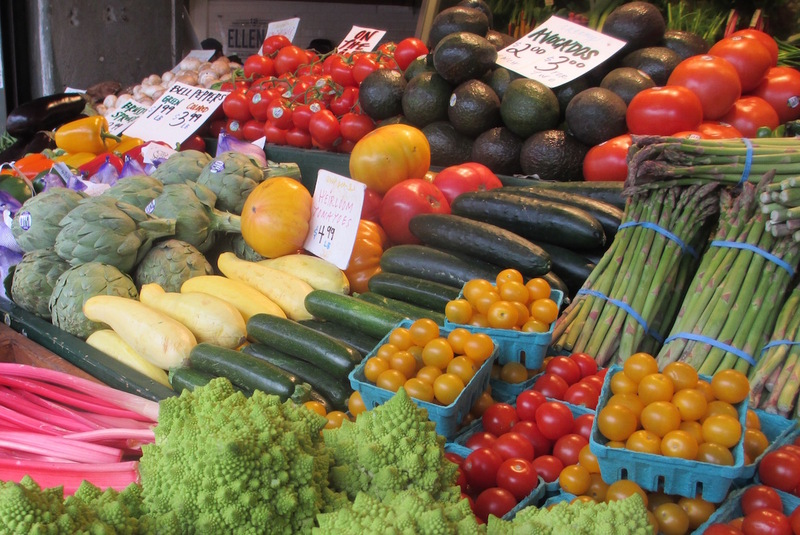 Vendors carrying produce, flowers, artisan products, and baked goods entice the tourists at Pikes Market down along the waterfront. The blast of color and natural shapes caught my attention. The city is filled with contrasting shapes, lines of different strengths, and shots of color in the structures, everyone vying for attention. 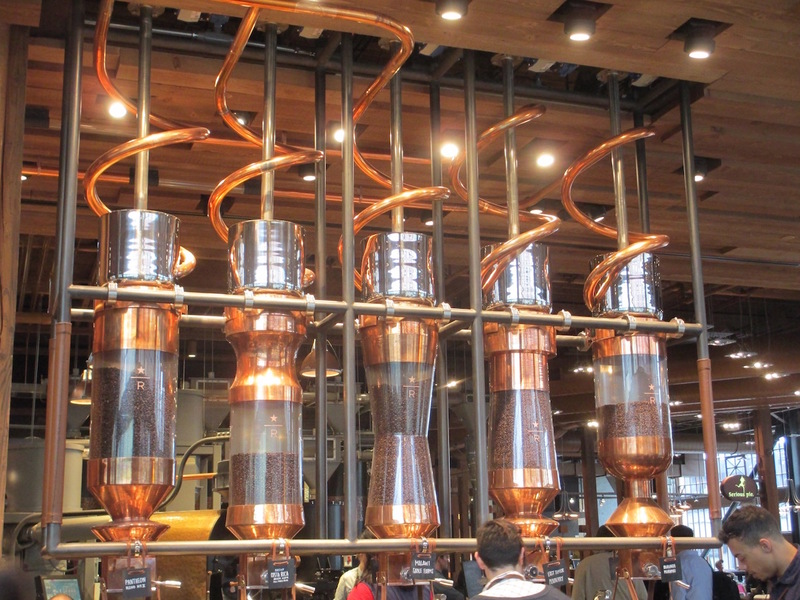 And then there was the sensual allure of roasting coffee at THE Starbucks Reserve Roastery and Tasting Room. Notice the gentle curves of the copper tubes and the warm color of the roasted beans awaiting the personal selection. All of my senses were heightened. I am sure to end up with some visual artwork from these hours spent in the Emerald City. Traveling from the West Virginia mountains to a metropolitan area increases the awareness of structure. This entry was posted in elements and design in art, Fiber Musings, travel, Workshops, Year Study and tagged fibers, Okan Arts, Puget Sound Rug School, Seattle, Susan L. Feller on March 10, 2016 by Susan L. Feller. Sketches and small studies reveal patterns, address color nuances and encourage decisions. What will be explored again, how large, using what materials, techniques, how many times? This entry was posted in elements and design in art, Fiber Musings, hooked rugs, textile art, West Virginia Artists, Year Study and tagged fine craft, slow stitch, Susan L. Feller, west virginia on February 17, 2016 by Susan L. Feller. Each are available for sale on RuckmanMillFarm.com enter the date in this format 10-1-14. 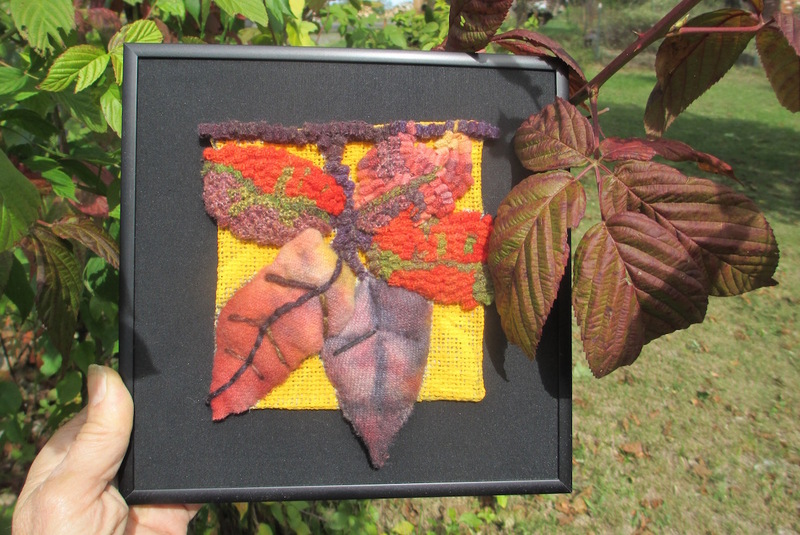 This entry was posted in elements and design in art, Year Study and tagged fiber artists, fine craft, Susan L. Feller, west virginia on October 1, 2015 by Susan L. Feller. Two paths converge with my work: history and art. Documenting who created the artwork begins the archival trail for future researchers, bringing “life” to an object. The squares are not individually signed within the work but I am stitching a label to each along with the online archival record at Year Study. Those which are framed include labeling in several steps. Thrilled with the end results – a unique piece of art, off to its new home. 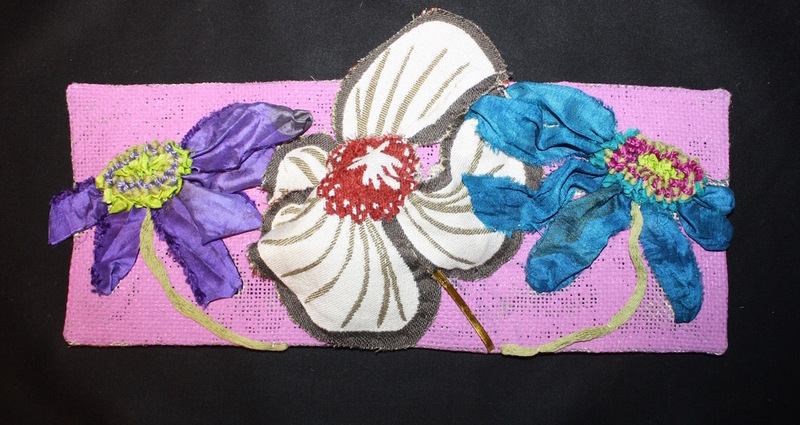 This entry was posted in elements and design in art, textile art, West Virginia Artists, Year Study and tagged fiber artists, fine craft, Susan L. Feller, west virginia on September 30, 2015 by Susan L. Feller.